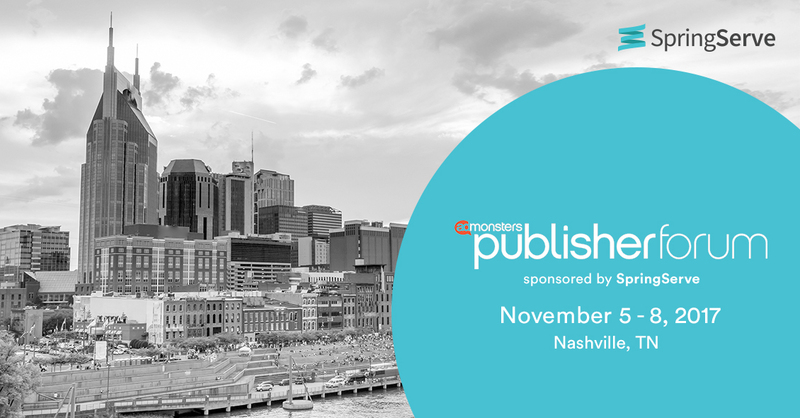 We are excited to announce that we will be sponsoring the upcoming AdMonster’s Publisher Forum in Nashville from November 5th to the 8th. This year’s theme, “Defining the Future of Digital Media” is fitting for SpringServe, an open video platform that helps publishers handle the multitude of complexities that they face in video today. The forum showcases publishers from the ad tech industry and invites them to collaborate and offer opportunities to take away actionable insights for their company. There will also be several occasions to network with likeminded peers, including SpringServe’s sponsored opening dinner reception on Sunday, November 5th. In addition, SpringServe is sponsoring all activities on Tuesday, November 7th which include the Sound of Music Nashville Tour, a Redneck Comedy City Tour, and the Nashville Brewery Tour. Our team will be on site to learn more about your plans for the future, answer questions and mingle. We hope to see you there! Want to set up a meeting? Email us at marketing@springserve.com.